The walled city of Weld is under attack from ferocious flying creatures that raid in the night, bringing death and destruction. The Warden calls for volunteers to find and destroy the enemy invaders, and the heroes of Weld answer the call one by one, never to return. Rye is too young to go, but his brothers are among the lost and he is determined to find them. Will he get the chance to save them? What terrors await him beyond the Wall? This gripping tale of a scarred but enchanting world is the first in a stirring fantasy trilogy from Emily Rodda, the internationally bestselling author of the Deltora Quest series. 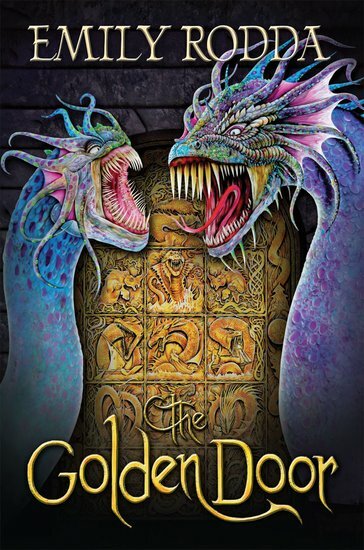 The Golden Door: Review Rye has 2 brothers, Dirk and Sholto. Their tiny city called Weld is in Dorne. Weld is under attack by some creatures called Skimmers. The has destroyed crops, crumbled houses and have killed many people during the process. Once they taste blood, they go back to the same place to taste human blood once again. Winner of the Children’s Book Council of Australia’s Book of the Year Award a record five times.